Brickies Chefs and Tilers – New Australian Visa Opportunities?? 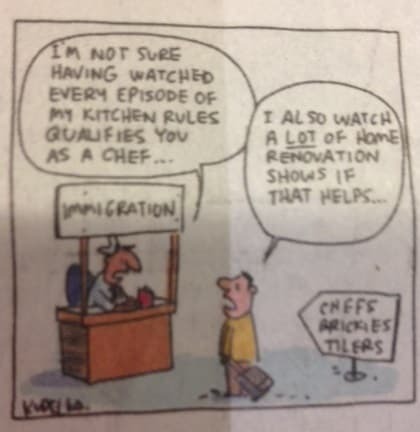 The Weekend Australian today is reporting that the occupations of Chef; Tiler and Bricklayer will be added to the Skilled Occupation List (SOL) from July 1, 2014, meaning that migration to Australia now becomes a very real possibility for some lucky people. Great opportunity for Tradies coming up! Each year, the Australian Government reviews the SOL and makes changes in response to current labour market conditions in Australia. These changes to the SOL have been backed by key industry groups. An Australian Bureau of Statistics Labour Force Survey reports that around 76,100 Chefs currently work in Australia. The 2014-15 Skilled Migration Program will cap Chefs at 3%, meaning that 2283 overseas Chefs may be eligible for a visa. This will be welcome news to many prospective migrants, who have struggled to find a suitable employer sponsor. It will mean that people who are suitably qualified in these trades will be eligible for Skilled Migration, where they can obtain a Visa in their own right without an employer sponsor. Applicants need to achieve 60 points in the Points Test and must have a positive Skills Assessment. Given that there are limited places available, we’d recommend contacting us as soon as possible if you think you could benefit from these changes. A Skills Assessment could take up to 12 weeks; and this will be the first step for most people.